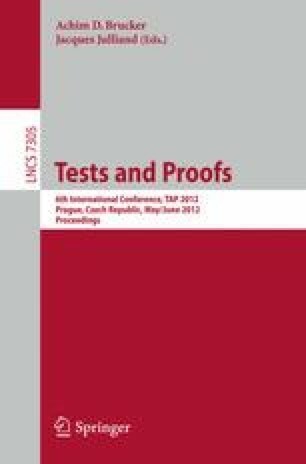 Bounded-exhaustive exploration of test case candidates is a commonly employed approach for test generation in some contexts. Even when small bounds are used for test generation, executing the obtained tests may become prohibitive, despite the time for test generation not being prohibitive. In this paper, we propose a technique for reducing the size of bounded-exhaustive test suites. This technique is based on the application of coverage criteria on the representation invariant of the structure for which the suite was produced. More precisely, the representation invariant (which is often implemented as a repOK routine) is executed to determine how its code is exercised by (valid) test inputs. Different valid test inputs are deemed equivalent if they exercise the repOK code in a similar way according to a white-box testing criterion. These equivalences between test cases are exploited for reducing test suites by removing from the suite those tests that are equivalent to some test already present in the suite. We present case studies that evaluate the effectiveness of our technique. The results show that by reducing the size of bounded-exhaustive test suites up to two orders of magnitude, we obtain test suites whose efficacy measured as their mutant-killing ability is comparable to that of bounded-exhaustive test suites.